Kiss River is the second book in the Keeper of the Light trilogy. Set eleven years after the first book, the O'Neill family finds itself facing new challenges in the form of a stranger obsessed by the old Kiss River Lighthouse. But the answers lie deep below the ocean. And the lighthouse holds secrets that neither Clay nor Gina can anticipate…. Welcome back to Kiss River, the fictional North Carolina Outer Banks town that you visited in Keeper of the Light. I wrote Keeper of the Light in the early nineties, but didn’t write the second two books of the trilogy, Kiss River and Her Mother’s Shadow, until twelve years later in answer to the pleas of my passionate readers. 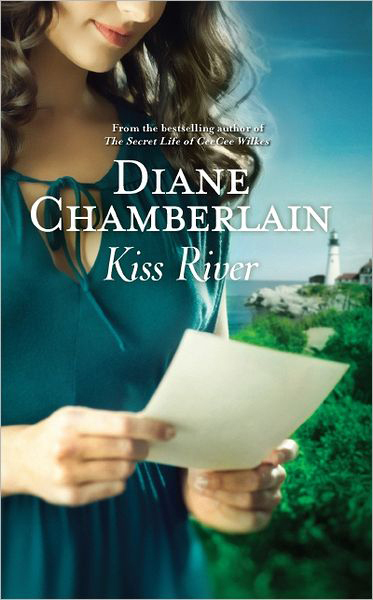 It was so much fun to go back to Kiss River and see how my characters had grown and changed over those twelve years. The people that you met as teenagers in Keeper of the Light, Lacey and Clay O’Neill, are now young adults in their twenties…but their lives are still as complex as they were in that first book. I hope you enjoy Keeper of the Light and Kiss River. Her Mother's Shadow will complete the trio in mid October, 2012. The air conditioner in her aging car was giving out, blowing warm, breath-stealing air into Gina's face. If she could have torn her concentration away from her mission for even a moment, she would have felt a pang of fear over what the repair of the air conditioner would cost her. Instead, she merely opened the car windows and let the hot, thick, salt breeze fill the interior. She took deep breaths, smelling the unfamiliar brininess in the air, so different from the scent of the Pacific. The humidity worked its way into her long hair, lifting it, tangling it, forming fine dark tendrils on her forehead. Another woman might have run her hands over her hair to smooth the flyaway stands. Gina did not care. After six days of driving, six nights of sleeping in the cramped quarters of the car, several quick showers stolen from fitness clubs to which she did not belong and eighteen cheap, fast-food meals, she was almost there. She was close enough to Kiss River to taste it in the air. The bridge she was crossing was very long and straight and clogged with traffic. She should have expected that. After all, it was a Friday evening in late June and she was headed toward the Outer Banks of North Carolina, an area she supposed was now quite a tourist attraction. She might have trouble finding a room for the night. She hadn't thought of that. She was used to the Pacific Northwest, where the coastline was craggy and the water too cold for swimming, and where finding a room for the night was not ordinarily an impossible chore. Through the open car windows, she could hear, but not see, the ocean on her right. The waves pounded the beach behind the eclectic mix of flat-topped houses, larger, newer homes and old beach cottages. In spite of the slow-moving stream of cars, the Outer Banks seemed open and wide and empty here. Not what she had expected from reading the diary. But the diary had not been about Southern Shores, and as she continued driving, live oaks and wild vegetation she did not recognize began to cradle the curving road. She was approaching the village of Duck, which sounded quaint and was probably expensive, and interested her not in the least. After Duck, she would pass through a place called Sanderling, and then through a wildlife sanctuary, and soon after that, she should, see a sign marking the road to the Kiss River lighthouse. Although she knew she was miles from the lighthouse, she couldn't help but, glance to the sky again and again, hoping to see the tower in the distance through the trees. Even though it was the tallest lighthouse in the country, she knew she could not possibly see it from where she was. That didn't stop her from looking, though. She had more time to study the little shopping areas of Duck than she wanted, since the cars and SUVs crept along the road at a near standstill. If the traffic didn't clear soon, it would be dark by the time she reached Kiss River. She'd hoped to get there no later than five. It was now nearly seven, and the sun was already sinking toward the horizon. Would the lighthouse be closed for the evening? For that matter, would it be open to the public at all? What time did they turn on the light? Maybe they no longer did. That would disappoint her. She wanted to see how it illuminated Kiss River, once every four and a half seconds. If people were allowed to climb the lighthouse, she doubted they would be permitted to visit the lantern room, but she would have to get into that room, one way or another. Only recently, she'd discovered that she was a pretty good liar. She'd lived her entire life valuing honesty and integrity. Suddenly, she'd become manipulative, a master at deceit. She could, when pressed, travel far outside the law. The first time she'd snuck into a fitness club to use the shower on this trip east, she'd trembled with fear, not only at the possibility of being caught, but at the sheer dishonesty of the act. By the time she sauntered into the club in Norfolk, though, she'd almost forgotten she didn't have a membership at the place. The end justified the means, she told herself. So, if visiting the lantern room of the lighthouse was not allowed, she would find another way to get up there. That was the entire purpose of this trip. She would talk with someone, one of the guides or docents or whatever they were, and make up a reason for needing to see that room. Research, she would say. She was writing about lighthouses. Or taking pictures. She touched the borrowed camera hanging around her neck. It was heavy, impressive looking. She'd make up something that would sound plausible. One way or another, she needed to see the lantern room and its enormous globe of glass prisms, the Fresnel lens. This could not be right, she thought. Even if the lighthouse itself was not open to the public, the grounds surrounding it and the keeper's house certainly should be. She did not consider herself a brave person, although these last few months she had found courage in herself she'd had no idea she possessed. Getting slowly out of the car, she locked the door behind her. She did have a flashlight in the trunk, but the batteries had died somewhere in Kentucky, so she carried only her map and the camera around her neck as she walked across the cul-de-sac. One end of the chain was attached to a tree, the other padlocked to a post. Skirting the post, she started walking down the gravel lane. Even if this was the wrong road, she told herself, what harm could she come to by walking down it? True, she could break an ankle in one of the many ruts or trip over one of the tree roots that raised the gravel in a disorderly veinlike pattern, More likely, though, the worst that could happen was that she'd come to someone's tucked-away home. She would apologize, ask for directions to the lighthouse. But then she remembered the horses. There were wild horses out here. And wild boars. They could be dangerous, she remembered reading in the diary. She imagined trying to climb one of the stubby trees to escape them. Her heart pounding, she listened hard for the sound of horse hooves or breaking twigs and realized that, this deep into the woods, she could not even hear the traffic. Only the thick, strange buzz of those crickets or whatever they were. It occurred to her that she would have to walk back through these woods again, and it would be even darker by then. How far had she walked? It couldn't have been more than a quarter of a mile. Stopping on the road, she peered hard through the trees. The road had looked quite short on the map, and surely she should be able to see the top of the lighthouse by now. She walked a bit farther and heard a whooshing, pounding sound that took her a minute to recognize as the ocean. It sounded close. Very close. Ahead of her, the road turned slightly to the right. The vegetation was thinner and she could see light between the branches of the trees. Quickening her step, she suddenly broke free of the forest and found herself in a small, sand-swept parking lot. Had this been the visitors' parking lot for the lighthouse? One thing she knew for certain by now: for whatever reason, the Kiss River light was no longer open to the public. "No," she said aloud. "Oh, no." She stood numbly, consumed by a distress that went far beyond disappointment. No wonder no one else was out here. It must have been the sea that destroyed the lighthouse, because even now the breaking waves swirled around the base of the tower, and it was apparent from the packed, damp sand beneath her feet that it was not yet high tide. A storm she thought. This was the work of a damn storm. Panic rose up inside her. She'd driven all this way. All this way. For nothing. For dashed hopes. Shutting her eyes, she felt dizzy. The sound of the waves cracking against the base of the light-house filled her ears, and a spray of salt water stung her face. As she took a few steps toward the tower, a house came into view thirty or so yards to her left. The keeper's house. Long ago abandoned, most likely, although she noted the windows were not boarded up and two white Adirondack chairs graced the broad porch. Odd. She looked up at the tower again, then took off her sandals. Dangling them from her fingertips, she stepped into the shallow water. It was colder than she'd expected, and she caught her breath at the unanticipated chill. The sand sucked at her feet and he water rose nearly to her knees one moment, only to fall to her ankles the next. The stairs had a woven texture and she could see straight through them to the purply-gray sky high above her and, as she climbed higher, to the dimly lit floor below. The spiral of stairs gradually narrowed and she quickly grew breathless. She'd never been great with heights, and she hugged the cold, white brick wall as she rested on the landings. Through the wavy glass of the tall, narrow windows at each landing, she could see the keeper's house. Then she'd return to the stairs, clutching the railing, no longer daring to look down as she climbed higher. The stairs rose several yards above the opening of the light-house, right up into the evening sky. Gina leaned against the brick wall, her heart beating more from fear than from exertion as she contemplated climbing those last few unprotected steps. She could sit on that top step, she thought, and look out at the ocean. Maybe she'd discover the lens was directly below her in the shallow water near the base of the lighthouse. She forced herself up another step, then another, holding on to the railing with both hands, and when she reached the top step, she turned and gingerly sat down on it. She was above the world here. The ocean was spread out in front of her like a huge, deep purple rug fringed with white. The thick wall of the lighthouse looked as if it had been chewed off by some huge monster, leaving the jagged edges of the brick behind. Gina shut her own eyes, feeling the sting of tears behind the lids. "I'll find a way, sweetheart," she said out loud. "I promise." She must have moved her head just a fraction of an inch to the left, because something caught her eye and made her turn around. And what she saw then stopped her breath in her throat. Every window of the keeper's house glowed with stained glass.